Life As Frankie Finds It: Traveling Tirya's Visit! 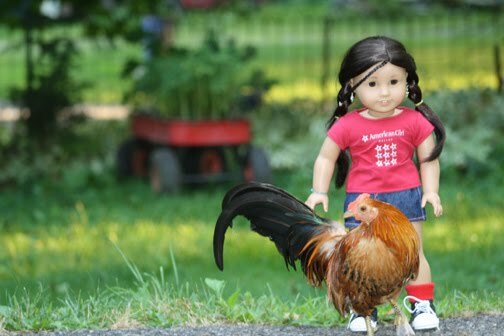 These are pictures of Tirya playing with a rooster! He let her pet his feathers. Here is Tirya with Tanner the goat. Tanner likes to pose for pictures. Here is Tirya on the tire swing. I think she looks like a model! We took turns spinning each other on the swing. It was so much fun! Thanks for letting me share Tirya's visit with you! Awesome .. what a wonderful surprise to see Tirya .. no one has been taking photo's of her so we did not get to see how she is doing .. it looks like she is having a blast visiting you too .. Cannot wait to meet you Tirya .. I like the pictures with Tirya and the chicken. How cool! Tirya looks awesome with the animals. I bet it's a blast to have her around.